From the begging of the 2000’s the horror movie genera has become harder and harder to impress. So many of them today are remakes, prequels and it seems that every classic horror movie needs to be rehashed in some lesser way just for the sake of a quick buck. Then we also have movies like “Saw” and “Hostile” that ushered in a new torture sub-genera. That’s all there is to it now days, if it’s not some kind of remake then it’s a film that banks on lots of gore and bloodshed which sacrifices all the really good qualities that a horror movie can offer. Thankfully, there’s still plenty of good horror flicks that come out every now and then in this millennium. 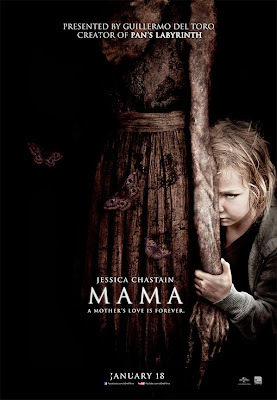 The 2013 movie titled “Mama” is definitely one of the more recommendable horror flicks to come out in recent years. It delivers all the old school chills and scares that I love, as opposed to cheap gore and gratuity. Plus it’s one of the precious few horror movies from this day and age that’s not a remake, however it is based on a Spanish short film of the same name and the plot barrows heavily from other films, which is fine when done with good taste. The story goes like this, a distraught father has just killed his wife and taken his two little daughters (a one year old and a three year old) who aren’t aware of the crimes he’s committed. They end up getting into a car accident and are then stranded in an abandoned cabin in the woods, I’m sure nothing out of the ordinary could happen in there right. Well, the father ends up getting killed, leaving the two girls alone in the cabin. Soon the two are approached by an apparition that becomes there watchful guardian, in return the girls lovingly nick name this phantom as “mama”. Five years later, the girls are discovered and reunited with their uncle and his fiancé played by Jessica Michelle. The two become the new guardians over the girls and they try their best to re-introduce them back to society. However, the mama phantasm has bonded with the girls so much that she refuses to part with them or let anyone else take them from her. 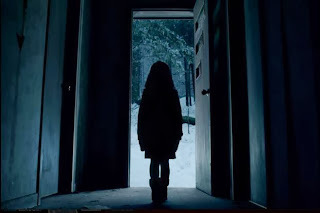 So the apparition follows the girls to their new house to scare away the guardians and take the children for herself. Much like Guillermo Del Toro’s 2006 masterpiece “Pan’s Labyrinth”, this film balances it’s horror with something of a fairy-tale overtone and a story of family bonding. Heck, the movie actually begins with the words “Once Upon a Time”, what follows is an awesome opening credit scene with a bunch of hand drawn pictures ranging from bright and magical to creepy and downright bizarre. It sets the tone very well and almost feels reminiscent of the 2001 movie “The Others”. Back on point, the film does have some genuinely touching moments. The scenes when the kids bond with their uncle or his fiancé are heartwarming and they make you forget that you’re watching a horror movie. As you’d expect, it doesn’t take long to get back to the horror movie elements and it delivers all the goods, creative camera work, shadows, a heavy atmosphere and lots of quiet moments in the house with a faint lullaby sung quietly in a dark corner which creates such an eerie mood. The shock moments are hit and miss, some are effective in making you jump while others are very predictable. 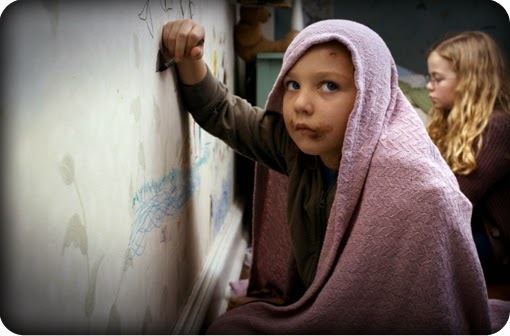 Personally, the scariest moments in the film involve the youngest of the two little girls, the older one seems to be finding her humanity day by day, but you just know something’s up with the younger girl. She’s always staring at the adults like she’s planning to kill them, as if she doesn’t want them to replace mama. 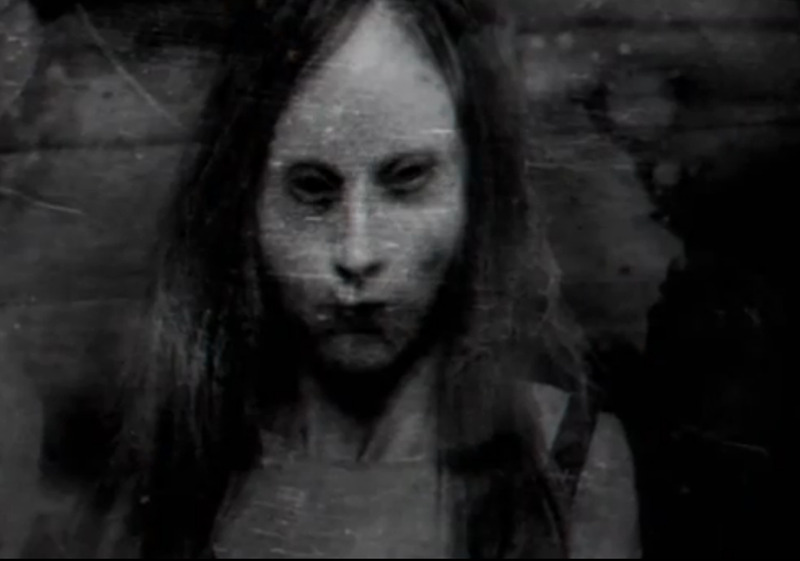 Then there’s moments when the adults wake up at night only to find this little girl crawling around on all fours, walking in and out of shadows and just acting really creepy. It might just be the scariest child to be featured in a horror film sense that little boy from Steven King’s “Pet Cemetery”. I mentioned earlier that the film borrows elements from other horror films, but there still done very well and casual viewers probably won’t pay that much attention to them. 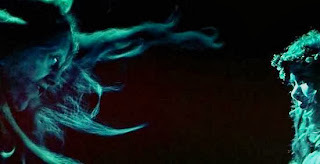 There’s a rotting black passageway that spreads like mold over the house walls which can easily be connected to movies like “Repulsion” and “Ringu”. Plus, you can’t help but think of the original “Exorcist” when you see a woman’s body bend and twist in some kind of Spider position. There’s also some really cool dream sequences, which further utilize creepy imagery, filtered effects, and even a flashbulb effect like from Alfred Hitchcock’s “Rear Window”. The “Mama” phantasm ends up getting her own back story latter in the film, however it’s kind of confusing and it spoils all the mystic that this creature had going for it, she also becomes less scary in the process. In the final act she takes on a more human appearance which isn’t nearly as terrifying as when shed appear in earlier scenes as a big shadow. There’s also a lot of false endings, one moment you think it’s going to end on a happy note but then something else happens that spoils it all. While the climax still provides excitement, it just doesn’t feel as creepy as the rest of the film and the ending gives me some really mixed feelings. Overall, this is still a pretty good horror movie and one that I highly recommend to fans of the genera. It certainly isn’t perfect, the script can get confusing and the ending leaves you wanting something else. Other than that, the film absolutely delivers with its sharp atmosphere, strong performances and quality visuals. It’s always refreshing when horror films use these techniques as opposed to all that cheap gore we get today and for that I say give it a watch this Halloween. 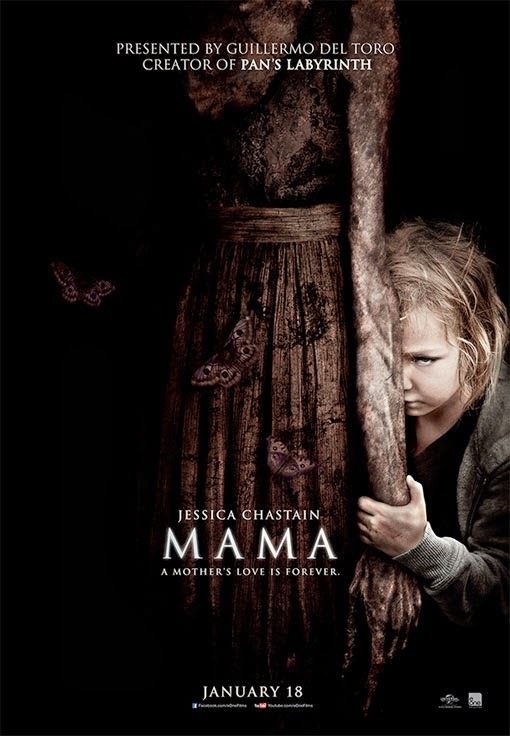 I give “Mama” 3 stars out of five.